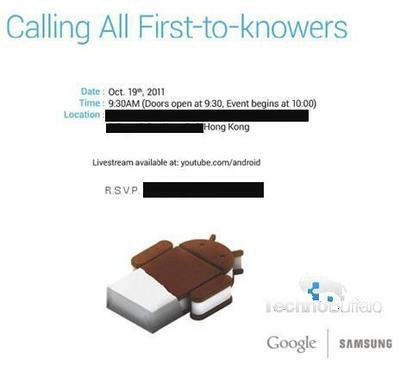 The Samsung/Google media event has been rescheduled to take place on October 19 in Hong Kong, China at [location redacted]. The event starts at 10:00 a.m. HKT with doors opening at 9:30 a.m. HKT. The event livestream will be available at YouTube.com/Android at 10 p.m. EST on October 18 for U.S. media who cannot attend the event. Samsung’s presence at the event seems to indicate that we’ll also see the launch of the next Nexus phone, expected to be called Galaxy Nexus (nay, Nexus Prime). Sammy’s been teasing the phone hard as of late, so there’s little doubt that we’ll finally see it in official guise next week. What’s interesting, and still a tiny bit of a mystery, is what role Verizon Wireless will have in next week’s proceedings. The rumor mill pegged Galaxy Nexus as a VZW launch exclusive, which makes sense because Big Red didn’t launch a Galaxy S II phone (amongst other reasons). Could the shift of launch venue from stateside to China be some sort of indicator that plans of change? Not likely. Google Android head Andy Rubin is scheduled to be in Hong Kong next week to speak at AllThingsD’s AsiaD conference, and he more than likely wants to take advantage of the platform to talk Ice Cream Sandwich. With a lineup featuring Apple SVP Phil Schiller and NVIDIA CEO Jen-Hsun Huang – not to mention former US Vice President Al Gore – AsiaD will attract plenty of attention, so Google’d be foolish to let the opportunity to make a huge splash pass them by. And, of course, they and Samsung are both no doubt champing at the bit to get their iPhone 4S answer out the door. Still, it’s a tiny bit odd that there’s no US event to coincide with the Hong Kong launch. Maybe the time zones just didn’t line up well enough to make sense. Maybe Verizon was planning a standard “press release launch” the whole time and Samsung’s fine with moving things to China given their own Asian roots. Or maybe El Goog’s calling all the shots here. Who knows? But, hey, it’s gonna be on YouTube! Who’s up for a Prime Time Nexus Prime (er, Galaxy Nexus) launch next week?